By counting the same colony again, we can obtain data on changes in colony sizes. These changes can be monitored in different years as well as within one season. If you are able to repeat colony counts, it helps to save your colony in the Gazetteer on the Upload form. This is done while you upload a record from your chosen colony. Fill in page 1 of the Upload form as usual (see here). Fill in a name for the Gazetteer - this can be identical to your locality name, but can be different - it needs to be a name you associate with the particular colony that you want to monitor. Save the form and fill in Page 2 as usual. 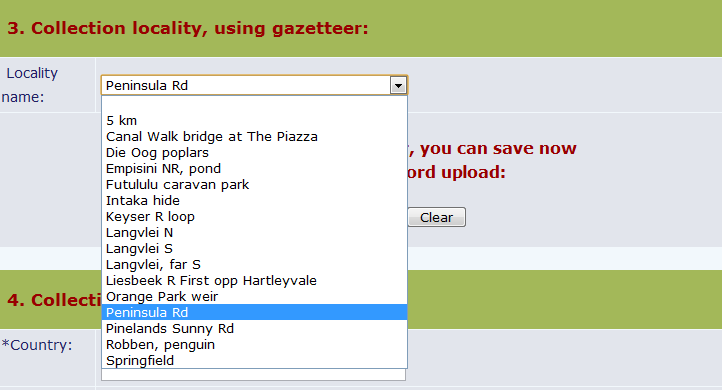 By using the Gazetteer you do not need to enter Country, Province, Closest Town, Locality, and Coordinates! If you have recorded a colony before but not saved it under Gazetteer, go to your PHOWN records under Summaries here. Find your colony of interest under the thumbnails and click on it. 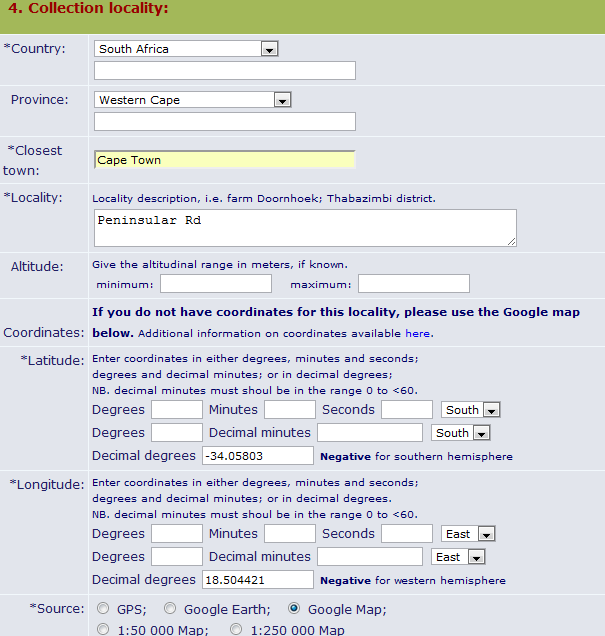 Then copy the locality details and coordinates to the Upload form (decimal degrees option) and save under Gazetteer as explained above. This means you will use the same coordinates for that colony (if you use a gps or google maps again, you may obtain coordinates that are very slightly different). Once your record has been accepted, you can find it (eg find it under your list of records here, or use another search method on the Summary page). Click on the thumbnail and you will see the full details for that record. At the bottom of the page you will see all repeats as a table of nest counts by date and also the thumbnails if you want to see the full record of another repeat for that colony. How often should you record repeat counts of a colony? This is entirely up to you. You should preferably not submit more than one repeat per day. You can submit repeats on a daily, weekly, monthly or random basis. If you submit repeats regularly but skip some becuase you are on holiday, for instance, that does not matter - simply continue when you can. This is a Cape Weaver colony in Rondevlei Nature Reserve, Cape Town. Note how the colony size steadily increased in the beginning of the breeding season (the repeats were started earlier in 2011). 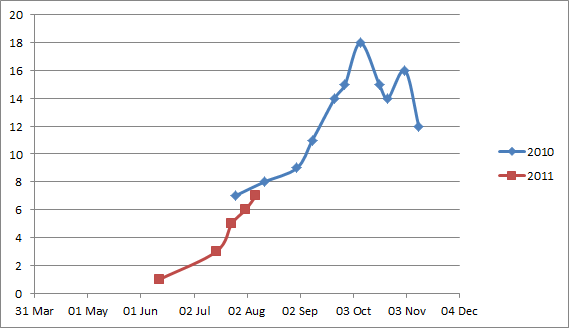 By early October the colony size fluctuated and eventually started decreasing. Your colony size may not change much, but this is still valuable data!